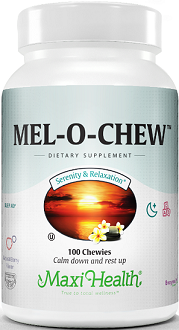 The product gets many positive reviews, but some consumers report serious side effects such as being groggy or experiencing digestive problems. Whether you’re a frequent flyer or not, you’ll know how jet lag can cost you precious lost time in your new temporary destination. 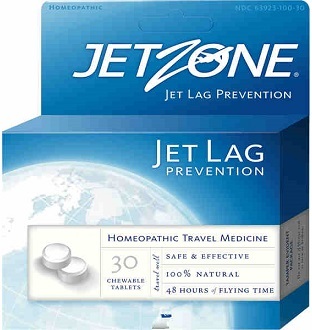 A homeopathic for jet lag or desynchronosis, as it is also known, is the subject of our review today. It is called Jetzone Homeopathic Jet Lag Remedy. Jet lag causes an interruption of the body’s natural sleep-wake cycles by disturbing the body’s internal clock. 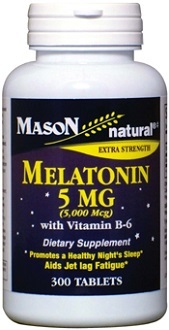 It causes sleep deprivation, lethargy, restlessness, headaches and mood swings among other symptoms. This remedy is homeopathic. Homeopathy is a mild and natural traditional form of medicine that treats symptoms by exposing the body to more like symptoms. This is done according to the Law of Similars. Those who subscribe to homeopathy believes that it works because the body is then stimulated into healing itself. Arnica Montana- This ingredient fights sleeplessness and restlessness when overtired. Kali Phosphoricum- It fights weakness, tiredness, and the headache that results from fatigue. Cocculus Indicus- It is essential for preventing constant drowsiness when a traveler loses sleep. It also treats headaches. Nux Vomica– This ingredient fights anxiety, heartburn, and restlessness. Gelsemium Semperviren- It relieves insomnia that results from exhaustion. Argentum Nitricum- A remedy for mental anxiety. The last four ingredients are inactive and are used to make the tablets. We will focus only on the rest. Arnica helps you sleep when you simply are not able to dose off – it is effective in both pill and oil form. Gelsemium Semperviren does the same, as does Kali Phosphoricum, which also alleviates fatigue-related headaches. Similarly, Cocculus Indicus treats post-travel headaches while Nux Vomica fights anxiety and heartburn. Argentum Nitricum also helps with anxiety. Together, these ingredients should go a long way to alleviating the night symptoms and some of the day symptoms. Anxiety due to not getting enough sleep would be one of the daytime symptoms. 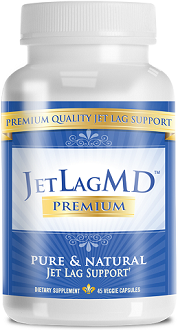 Many jet lag remedies do not target associated headaches, so this is notable about this product. Homeopathy is not for everyone and results vary from individual to individual. This is especially true if you prefer the instant effects of pharmaceutical medicines. Time zone change syndrome is not only about fighting insomnia – the days could be characterized by a hangover-type feeling. This needs to be combated as well so you feel fully energized and alert. This treatment does not seem to address that. Take one tablet every 2 hours while flying and chew one upon landig. Should you fall asleep while flying, continue with this 2-hour regimen upon waking. Start by chewing a tablet an hour before your flight. Children as young as 6 can take these tablets. Consult a doctor if you are pregnant or breastfeeding first. Do not overdose, and if your symptoms continue for longer than 7 days, see a doctor. These tablets, which come in chewable form, cost $8.93 on Amazon. This is what you’ll pay for 30 tablets. While one pack is cost-effective, it is only designed to last for one 38-hour round trip. We could not uncover any evidence of a guarantee. A confident manufacturer would, in our experience, back their product with a returns policy on the strength of their conviction that the product works. This is therefore not a risk-free purchase. The product gets many positive reviews, but some consumers report serious side effects such as being groggy or experiencing digestive problems. One of the good things about these tablets is how easy they are to take – you simply chew them, and there is no water required. 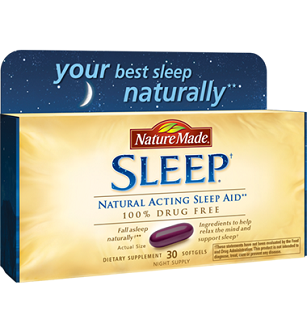 Unlike other products, you do not take this after the fact, in other words, after landing. You prepare your body just before and during flying. This is quite a different approach, which makes sense. The product is not risk-free and rather expensive, compared to other products which can be used over multiple trips. The marketing approach has been well thought-out by Global Source as a number of high profile celebrities are seen endorsing the product on the website – but if these are paid endorsements, they cannot necessarily be trusted. Another reservation about the product is that it does not adequately address some day time issues of jet lag, namely feeling groggy and disoriented. This would add to the cost as you would need to buy an additional remedy.